Had to share these photos with you. We were at Laguna Beach Tuesday and a woman asked us if Amadeus was friendly and if so she wanted to know if her little girl could pet Amadeus. 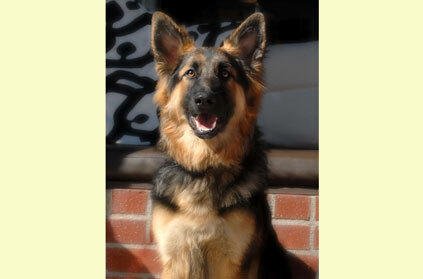 The woman had grown up with German Shepherds and had great memories of her dogs. Just wanted you to see what a wonderful ambassador for German Shepherd Dogs he is. He is very gentle with children. People very often want to pet him or ask if their kids can pet him and he likes it. Best of all, he is an affectionate giant puppy who wants to be hugged and he also gives a lot of hugs and kisses. We really love him!!! (and he loves us which is important).